With the advent of the spring cherry blossoms, it's time for another popular annual spring tradition in the Lower Mainland: the Vaisakhi festival. Vaisakhi celebrates the beginning of the Punjabi harvest and marks the birth of the Sikh faith. 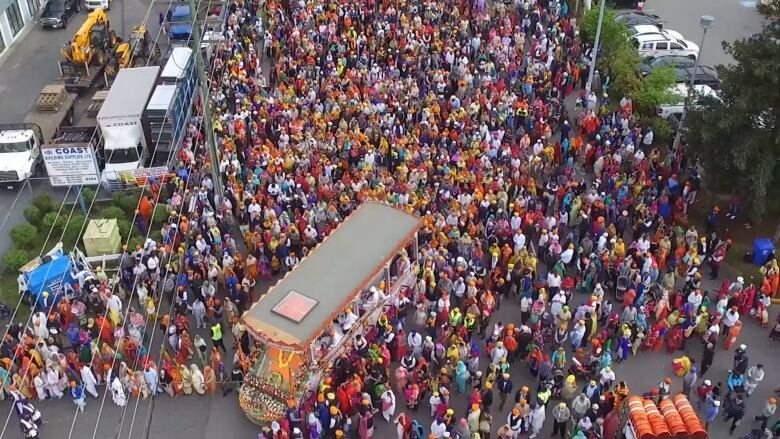 It's one of the most significant dates in the year for Sikhs, and a great time for Metro Vancouverites to join in the celebrations and parades. The Vaisakhi parade is scheduled for Saturday, April 14 from 10 a.m. to 5 p.m.
CBC Vancouver will be live on scene with reporter Bal Brach in the action. The parade will start at Ross Street, travel west on South East Marine Drive to Main Street, north on Main Street to East 49th Avenue, east on East 49th Avenue to Fraser Street, south on Fraser Street to East 57th Avenue, east to Ross Street, and south on Ross Street to the temple. The Surrey parade is one of the largest events in the city in the year. The parade will begin at approximately 9 a.m. PT at the Gurdwara Sahib Dasmesh Darbar, located at 12885 85th Avenue, and will conclude there at approximately 6 p.m.
Two brothers from Surrey are hoping businesses and families who serve up free food at this year's Vaisakhi parade find alternatives to Styrofoam to cut down on the waste headed to the landfill.